"This isn't a regular detective job I called you about," the night club singer told Hodgson. "It's not a dead body and a lot of clues and all that stuff." That's what she thought, but it didn't take long for him to prove her wrong! Hodgson, leaner than ever in black dinner clothes, went down past the gleaming bar to where the singer lounged at a table near the band-shell. The colored band was on, and she was drumming idly on the cloth with a little wooden noise-maker in time to the pulsing strains of You Walk Like My Man. Hodgson stopped at the table. 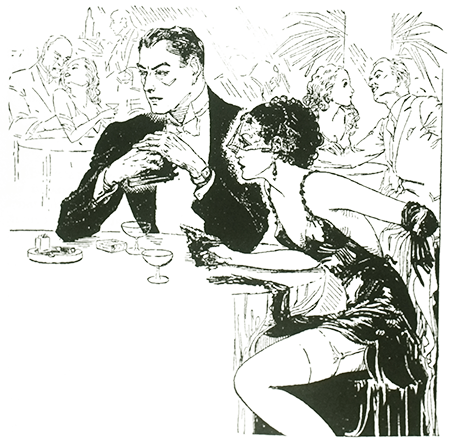 The girl looked up with the leisurely insolence of pretty women who must be nice to drunks. "Mind if I sit down?" Hodgson said. The girl said in a bored baritone: "I don't mind if you fall down." Her hand, with its incredibly long nails, went on tapping with the little wooden hammer. "That's damn white of you," Hodgson said in an indifferent voice. He pulled out a gilt chair, sat in it "Well, I see you're still alive." His low murmur brought the girl's head up. Her eyes were extraordinary. Their slanting length was no trick of makeup, the startled look that lifted her sleepy lashes showed that clearly. "Oh!" she said. "I didn't — "
"Skip it," Hodgson said. "I'm not hurt." He leaned forward, lowered his voice again. "Well — I'm working for you. What's my assignment?" "This isn't a regular detective job I called you about," she said. "I mean it's not a dead body and a lot of clues and all that book stuff." "Most of 'em aren't" Hodgson said. "I got that much over the phone. You want me to keep you from getting killed, right? Who do you think's going to kill you? And w hat do you want me to start doing right now'?" The band finished the set of dances, made way for the white combination. A trumpet blew "A". The singer smoothed the satin that was a sheath from high bosom to flat waist. "I — I don't know," she said, bewildered. "You see, they probably wouldn't do it themselves. They'd send somebody. And listen." She put a warm palm on the back of his hand. "You can't stay here. Talking to me, I mean." The band burst into a slow introduction. The girl got to her feet hastily. "This is my number. I've got to go." She came so close to him he could see the powdered hollow of her bodice, smell the heavy perfume of her hair. "Go talk to the tap-dancer. Don't come near — "
The leader pointed his trumpet at her and blew an irritated riff in her direction. She hurried to the bandstand, loosened the thumbscrew on the mike stand, and lifted it close to her curved lips just in time to start the song. Her voice was incredibly low — deep and hoarse as a man's, but with a vibrant huskiness that was all woman — and passionate woman, moreover. The draped lines of the evening gown, falling in long silken flutings from her lithe hips made her seem even taller than she was. She moved her body in rhythm, with an almost imperceptible rocking motion, and sometimes, when she moved her glistening lips close to the microphone, she let the curtains of her lashes fall over her long tip-tilted eyes. Even the waiters stopped to watch her work. Hodgson looked around, saw a girl in a bellhop costume, short skirt, and patent-leather pumps. He moved aside and back, whispered: "That better?" as if he had been interfering with her view. "She's really terrific, isn't she?" The dancer nodded, not looking around. "She makes me want to go out and — " The spell-bound look in her eyes made words unnecessary. The singer, eyes closed, was holding the mike standard to her breast, and the look on her face could have been pain — or ecstasy. The crowd was hushed. A sharp-featured man at a table in the spotlight wet his lips. Hodgson looked down at the little tap-dancer. Her slender body moved with the singer's. Her youthful face held the same swooning recklessness. The song ended in a burst of applause. Hodgson, clapping, smiled at the dancer. The lights went up, the singer came down from the band-shell, drapes swirling. Hodgson said casually to the dancer: "What're you drinking?" She looked swiftly at him. The heavy tan stage makeup made a mask of her face. "Whiskey and soda?" she said. Hodgson called a waiter, gave the order, and sat down at the dancer's table with an expression of complete disinterest — detachment, almost. The dancer stood it for a few minutes. "No more. I used to play drums, but I didn't like the hours." "I suppose a big fellow like you needs plenty of sleep." "It's not that. Who wants to be up there pushing a bass-drum pedal when all the fun's going on?" She poured in Scotch, stirred it without looking up. "Why, is there fun? I must be missing something." Hodgson said, spacing the words: "Maybe … you … are." She looked up and the tip of a red tongue came out to wet her lips. "And what would you suggest I do about it?" "Mother wanted Kurt but father held out for Mike." "Well, Mike, what should I — ?" Taffeta swished. A woman's hearty voice said: "Well, Mike Hodgson I At it again! Isn't it the limit, Asa, how they get prettier and prettier, too?" Hodgson stood up to bend in sly courtliness over the heavily-ringed hand of the brisk, daringly-gowned woman eyeing him with fond amusement. The heavy-set distinguished man with her smiled. "How are you, Hodgson?" He shook hands. The woman turned to the dancer. "Could we borrow him for just a moment, dear? I'll send him right back." She smiled. "Handsome devil, isn't he? I'd've fallen for him myself if Mr. Wheelock'd've given me permission." She looked fondly at her husband. The dancer said: "Oh, that's all right." At the Wheelock's table, Mrs. Wheelock slid a flat case under the table to Hodgson. "I want you to mind this for me," she said. "I know you did good work for us on the pearls — getting them back when even the insurance companies had failed. But this is really important. I'm wearing the paste collar, and the one I've just given you is the real one. I just discovered I'd brought it along in my bag by mistake. The police told me not to wear my best pieces while this gang is still operating. Be awfully careful of it, Mike, won't you?" "Sure. How'd it get in your bag?" "Damfino. I don't remember putting it in, though the maid said something to me about the clasp being loose. I was going to take it to the jeweler's and I may have stuck it in there absentmindly." "Wearing that paste collar was just as bad," he said. "They'll finger you for it, and you know these boys aren't above shooting. I don't mind recovering jewelry for you — that's what you pay me for. But I don't want to see you knocked off just to satisfy a little silly vanity." "You see, Asa? He talks to me as if I were a child. Well, Mike, run back to your little friend. She's absolutely lovely, Mike. Known her long?" "Not long enough. When do you want this?" "Bring it around tomorrow'll be all right. Or can you give it to Mr. Geary at Black Starr and tell him to fix the clasp." Back at the table the dancer looked up from her drink. Hodgson sat down. "When do you go on?" The girl said: "Excuse me," and got up and went over to the bar. She stood there talking and laughing with a party. When it became obvious she was not coming back, Hodgson went over to the singer's table. "What'm I supposed to do now? The babe ran out on me. Can't you give me some idea of what this is all about? Who do you think's going to kill you? And why do you want me to play with the tap-dancer?" "Damn you, Hodgson!" she said between her teeth. "I told you to stay away from me! Do you want to get us both killed? And go after that girl — or you'll get me killed! Make love to her, fondle her, act as if you were nuts about her. And in the third I had Ruffnreddy and know what a mudder that nag is, and my little parlay just — "
"Have you gone nuts? What the — ?" A man's voice behind him said: "Toni, I want to speak to you about your next number a sec." He started to get shakily to his feet and something like a sack of sand fell on him, knocking him to the floor. Hodgson turned, saw a thick-set man with black curly hair, a beetling scowl. Hodgson looked at the girl. Her face, under the rouge, had gone white. She took the man's arm. "Sam darling! Listen, will you make the boys play softer behind me on my Fog number?" She turned carelessly to Hodgson, said in a tone of utter indifference: "'Bye." Her eyes, wide with fright, gave him a swift, intense look, and turned away. Hodgson went through the tables toward the bar. A full-bosomed redhead in blue, looking off to one side, bumped into him and turned snarling: "Why the hell don't you look where you're going, you dope!" Hodgson apologized, looked puzzled after the red-head. The dancer left the bar, went down toward the bandstand. Hodgson was in her path. She looked up, saw him, said: "Oh, hello," and started to pass on. Hodgson reached out, took her hand, put a hand on her shoulder. "Hey listen, Judy — "
"Who's that guy with the black hair talking to the singer?" "You mean Sam Klaub? He's the boss." "And the red-head I just bumped into. See, over there? The woman watching them?" "That's Mae Klaub, Sam's wife." Her tone was cold. Hodgson said : "And I have a compliment for you. Mrs. Wheelock, that woman that spoke to me remember? I used to work for her — well, she said you were absolutely lovely." The music was soft. Hodgson looked in the girl's eyes and said: "That's right. Who am I to argue with her?" "You must do as I tell you. Make love to the dancer and stay away from me. If you see anybody watching me too closely, get close to them in case they pull a gun." Hodgson, crumpling the note and pushing it into his coat pocket, caught the girl's eyes on his face. He said carelessly: "Somebody touting a horse to me." Judy came so close to him he could see the powder at the edges of her blond hair. "Who are you, anyway, Mike?" She studied him. The music soared. She said, low-voiced: "Did you really mean what you were saying back there about me — missing something, I mean?" Her slender figure rubbed against him like a cat's. Her fingers squeezed his. She looked at him in wordless understanding. "I got to run upstairs to my dressing-room. It's all right. You can come along." It was a long room with a powder-dusted dressing table, costumes on hooks, a day couch. She closed the door behind them very slowly. "Why?" She locked it, came over. "Why did you want me to — ?" Hodgson reached out and took her in his arms. Her lips murmured under his. Her hands moved over his back. She went limp in his arms, her knees like water, sank back to the divan. "Oh, Mike — !" A gun went off in the street. Hodgson jumped up, ran to the door, unlocked it, and pounded down the carpeted stairs. People were milling through the entrance. He shouldered through them, ran up the glaring cement walk to where Wheelock, his opera hat crushed under his head grotesquely, lay gasping in a pool of blood. On her knees beside him, her throat raked with raw scratches, Mrs. Wheelock was sobbing: "Oh, darling, oh, can't somebody — ?" Hodgson bent over the wounded man. "Who shot you? Do you know me, Wheelock?" Blood bubbled on Wheelock's lips. He strained, fell back. Mrs. Wheelock shrieked: "He's dead!" and fell over in a faint. A policeman lifted her. Hodgson looked around: "Who saw this, anybody?" A cab-driver said: "It was two guys wid caps. Dey run up, grabbed de necklace off de lady's neck and de guy, here, tries to stop 'em and makes a pass for one and de guy shoots him and dey both beat it down dat way." Hodgson looked down the dark street with its maze of alleys, dark hallways, vacant lots. He walked down, examining the sidewalk. Up at the corner a dark cross street led left and right. The left was brighter than the right. He turned right, down the cross-street. He asked everybody he met: "See a couple of men go past here?" People looked at him, shook their heads. At the next comer a stout man in shirtsleeves was exercising a dog. Hodgson asked him the same question. The man laughed. "Hell, guy, there's men going by here all night long!" Hodgson thought. The man with the dog turned away. "These guys'd be looking back," Hodgson said. "Oh, them guys! Yeh, I seen them. They went up that way. Half-running, was they?" "Probably. Thanks!" Hodgson broke into a run. The street carried him to the avenue again, past an alley that ran back through to the club. Hodgson went down to the corner. No one there had seen the fugitives pass. He went back, questioned the man with the dog. He could learn only that the fugitives wore no caps, and that one of them "kept holding on to his throat, like." In front of the club the crowd had scattered except for a handful of newcomers asking questions about the blood. Hodgson went inside. The band was blasting away, trying to give the impression nothing had happened. The black-haired proprietor, Sam, was gesticulating with cops at the bar. A waiter came up. "You're wanted upstairs. Telephone. On the landing." Hodgson went up the wide stair, down the empty corridor and found the telephone booth. The receiver was hung up. He scowled, came out. "I'll take the jewel case, bud," a voice said behind him. Something hard poked him over the kidney. Hodgson stiffened. "Guess the rod talks," he said resignedly. "Here y'are." He turned slowly, making no sudden moves, unbuttoned his jacket, reached inside, and brought out the case, handed it over. The man with the gun was a beefy sandy-haired youth in his late twenties. He put out a big hand for the case, closed his fingers around it. Hodgson put his hands up level with his ears. He cringed, eyes on the gun, less than a foot from his belt. The red-headed thug slid the jewel case inside his breast pocket. His mind was on the case, not the gun. Hodgson slapped both hands down hard, twisted sidewise, away from the crashing pistol. His left, at the man's wrist, swept the pistol away from his body. His right, higher, caught the forearm as in a swift, crossing scissors, turning the arm, knocking it aside. The man dropped the pistol. 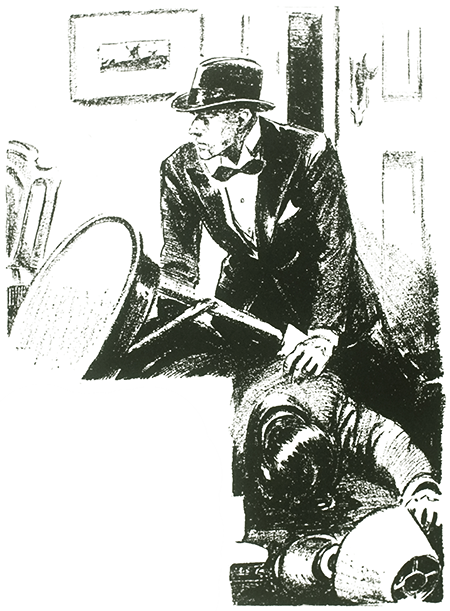 Hodgson stepped in and hit him with everything he had behind the punch — six inches above the man's belt. Hodgson spun. Down the corridor a pimply youth with a shock of wiry hair was squinting over a heavy automatic for a second try at Hodgson. Hodgson flung himself down, fumbling for the pistol at his arm-pit. He got clear and shot just as the pimply-faced youth's bullet tore a furrow in the carpet at his head. The red-head aimed a glancing kick at his head and stooped for the gun on the carpet. Hodgson kept his gun on the pimply-faced youth, fired and saw the youth's gun drop, saw him put a hand to his belly and pitch froward on his face. The redhead scooped up the pistol near Hodgson's feet. Hodgson tried to swing his own gun over. The red-head saw it coming and lashed out with a heavy boot that knocked it from Hodgson's hand. Hodgson, on his knees, tried to run on them over to the pistol. He fell on it, twisted, swung it around. A gun crashed over his head. He shot blindly. Something dropped heavily to the carpet. He started to get shakily to his feet and something like a sack of sand fell on him, knocking him to the floor. He pushed the red-head's body off him, got to his feet and looked down at the sprawling gunman. The jewel-case had fallen half out of the man's pocket. Hodgson picked it up, went down the corridor, putting his gun away. A cop with a drawn gun met him on the stairs. "Stop!" "Couple bandits up there tried to stick me up," he said. "I'll give you the pinches — if they live, that is." "We'll just have a look at 'em," the cop said. "Sleepy Willie and Joe the Butcher! Well, well! A nice bag. They're dead, all right. You bring 'em both down yourself?" Hodgson nodded, gave him the story. The cop called in. Hodgson went downstairs, telling him: "Stick around. I'm going to break this thing now." The band was blasting — open horns, din enough to drown a firing squad. Hodgson looked around for the singer. She was sitting at her table, a long cigarette holder in her lips, pointed fingers toying with a packet of paper matches. A rough-looking man came out of the kitchen, looked around, and started for her. Hodgson pushed through the crowd around the bar. Running was impossible. People stood chatting in his path. He shouldered past them, half-running, half pushing — A path cleared miraculously. Somebody — a girl — came out of the crowd and began clawing his face with pointed nails. Judy! "Make … love … to … the … dancer!" she screamed. Her striking nails emphasized each word. "Play me for a sucker, will you!" Hands tore her off. She sobbed: "And to think I believed him, the dirty two-timing — "
Hodgson wiped his bleeding face. "That was bad, Judy. That cinched it. You're done now." She said through angry tears: "Done? What do you mean — -done!" She shook off restraining hands. "Oh, I won't bother him again! Let me out of here. My makeup's ruined!" She started down toward the kitchen. The rough-looking man came up the aisle. Hodgson plunged after her. The rough-looking man was quicker. The knife in his hand was a bare gleaming flash and he was running out the kitchen door. The singer, on her feet, screamed. Sam, the proprietor, ran to her. A gun crashed. The room was a din. Hodgson reached the red-headed woman just as she pumped a second slug into her staggering husband — a shot meant for the singer beside him. Hodgson knocked the pistol down. It crashed, sent a bullet into the waxed maple floor. He twisted it from the woman's ringed hand, tore for the kitchen. The door was still swinging. He plunged through it, ran down a sawdust floor through the cellar and out to the alley. It was empty. He raced down it to the street. Far up, under an arc light, a man broke into a run. Hodgson pounded after him. The man turned. Hodgson flung himself into a doorway as a red spurt lanced the dark, and the crash of a pistol echoed in the street. Plate glass crashed in the street. Hodgson lined his pistol, steadying it against the brick edge of the wall. He shot carefully. The man up the sidewalk jerked, staggered, went to his knees. He was up again, stumbling away in a limping run. Hodgson yelled: "I'll drop you this time. Throw away the pistol!" The man turned, tried to lift the gun, swayed and collapsed on the sidewalk. Hodgson, gun lifted Warily, went up to him. He took the pistol out of the prone man's limp fingers, tore open his coat. The wound was high in the leg. Hodgson made a crude compress, sent a man from the growing crowd to call the police. The man on the ground stirred, licked his lips, opened his eyes. "Who hired you?" Hodgson pressed. The man said nothing. Muscles twitched in his bristled jaw. "You dope! You killed the wrong girl!" Hodgson said. The man's lids lifted a little. "Entertainer, sure. But not the dancer — the little sing-song gal, right?" The man's eyes were wide open now. "You were working for her. How much'd Mae pay you for knocking off the girl her husband was trying to fool around with? "Oh! Going to clam up, hunh? Well, bo, we don't fool around with girl-stabbers." Hodgson rolled the man over roughly, went through his pockets. "Hah. Cash on the line, hanh?" He held the roll of fresh bills to his nose. "Right out of her handbag. That's Mae's perfume. She bathes in it. "Sure. I was guessing. But now I'm sure. You had to be working for one of them. Mac or Sam. If you'd killed the right gal, if you'd meant to kill the dancer, I wouldn't have got a rise out of you. When you acted surprised and didn't know there were two girls, I knew I was right. How's the leg, can you stand it?" A white police car pulled into the curb. Hodgson gave them details. "And if one of you'll come back into the club with me," he finished, "I think we can clean the whole thing up." The taller cop said: "I'll go." 'Hodgson led him down the alley, through the kitchen past gaping help into the club, where two policemen were having all they could do to hold the hysterical Mae Klaub. Hodgson went over to the cushioned wall-seat where a doctor was working over Sam Klaub. "Well, Sam, how's about coming clean. The racket's washed up. I shot Joe and Willie upstairs when they tried to stick me up for the Wheelock jewelry. And your little stoolie that fingered me to them — the little tap dancer, Judy? — -just got it from a cash-and-carry killer your wife put to work." Sam Klaub, lips compressed in pain, said: "You're crazy, fella, I don't know nothing about no Wheelock jewels. Why, even if Mae'd do anything so c-crazy as to hire a killer, why should she want Judy killed. It was Toni, the singer, she was jealous of." "Right. The guy that stabbed her made a mistake. He meant to kill Toni. Mae just told him 'the entertainer'. She forgot about the dancer. But don't worry. Everybody in town knows Joe and Willie were your handy men. And I know it was Judy that tipped 'em." "Yeah, Sam. Judy got curious about a note I stuck in my pocket. She got me upstairs and pretended to go for me to get a chance to get her hands on the note. When she was taking it out of my pocket, she felt the jewel-case. I didn't know she'd been in my pockets till she accused me downstairs of something. She'd've had to see the note to know about it." The girl, Toni, came up with a policeman. "I'm going down to the station to make a charge," she told Hodgson. "How much do I owe you?" "Nothing. You haven't told me yet what you hired me for. I'd say it was because you were afraid Mae'd have you killed out of jealously, or that Sam would because you'd stumbled on his racket, right?" "Things here and there. Can I call you a cab?" On the way to the station, Hodgson said: "Your testimony against Sam should put him away where he won't bother you. Of course you can go right on being a sing-song gal now, but I can think of better careers for you." Her long eyes were shadows in the dark. Hodgson put his arm out, drew her to him.